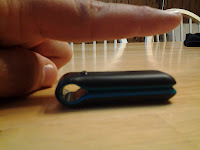 The Fitbit. Largely, Fitbit is a glorified pedometer. But it's an important tool that's helped me better monitor and regulate my health. In additon to it counting steps, it also gives me a (rough) indication of how many calories I'm burning a day based upon steps, BMI, and whatever specific exercises I log on it (such as running and cycling). Its online site (which sells a premium membership, that's not required if you purchase the Fitbit) offers a range of diagnostic measurements and input resources. For instance, I can log my food to get a sense of my caloric intake, add my sleeping time, and other relevant tools. So what's useful about it? 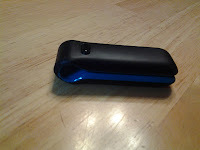 The pedometer is a powerful tool as it allows you to benchmark how much you are walking around. With it, I know how much I've walked/moved about in a given day. Yes, I can recall, but sometimes, I'm likely to overstate or understate things. With the Fitbit, I know whether I'm lying or not. Moreso, it allows me to make more informed decisions. Do I have more potato chips, a carrot, or should I at the very least, go for a walk? I occasionally use the food-monitor element as it helps to bring me back to being conscious of how much food I do eat in a day rather than rely on the guessing game of hindsight. It's very easy for me to mindlessly eat and every few weeks, I'll do a week of food monitoring to help restore the mindfulness of how much I'm actually taking in. The site has other features (badges, social networking sharing, calorie/fitness plans, etc. All of them are good, but the key for me with this tool has been it's step input and exercise input. As a pedometer, the other great part is that it's small and I rarely have issue carrying it on my underwear ban. It "fits" nice and easy. 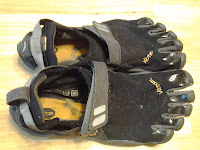 The other major purchase that I integrated into my life has been the Vibram 5 Finger shoes. These have definitely been a game changer in several ways. 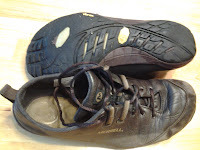 The Vibram shoes are ultra-slim and provide toe slots unlike the regular shoe. They're used in what is regarded as barefoot or nearly barefoot running. After hearing a lot about these shoes and how they help your posture and movement all around from my chiropractor and seeing several people wearing them, I took the plunge and bought a pair. When I first go them, they took me 5-6 minutes to get on (this is something that fades with time as your toes and you adjust to putting them on--it takes me less than 1 minute now). I started to go for walks with them and I kept increasing the walks. First, it was just trying them on and moving about, but soon I was doign 2-3 mile hikes 1-2 times a day. I called them hikes because I was going walking from where I lived to coffee shops in Salem to do various work. In self-transporting, I would also need to bring my laptop and several books--usually adding up to 20-30 points of additional weight (not an exageration either). After doing this for about a month, I went on a lark and ran around Lake Quannapowit in Wakefield. I ran most of the the first time and by the following week, I was running it entirely. I was really impressed with how much I could slip into the running. By the end of summer and early fall, I was running 5-6 miles regularly. With some urging from my brother and sister-in-law, I ran my first race. By seasons' end, I had hit the high watermark of 7.2 miles. All from having hated running my whole life and now, enjoying it enough to do this. Gotta be the Shoes? Yes. Someone out there may try to argue differently for me, but the shoes made the difference. I'm a large guy. 235 pounds, 5'11, and a wide frame. Not a runner's frame by far. Every time I've tried to run before, it wore and hurt on my body, and I was never really capable of keeping a solid rhythm of movement with my body that worked with my breathing. None of it came together. But when I run with the Vibrams, that disappears. Because I cannot slap my feet away on the pavement, I have to regulate my pace and step to work with the impact, not against it. While this means I certainly don't move fast (and I never will), I do feel the fluidity of movement with the Vibrams that I can never seem to have when I am running with normal shoes. I liked the thin-sole of the Vibrams enough that I also bought a pair of Merrell's that uses the Vibram soul, but makes a more-normal-looking shell. 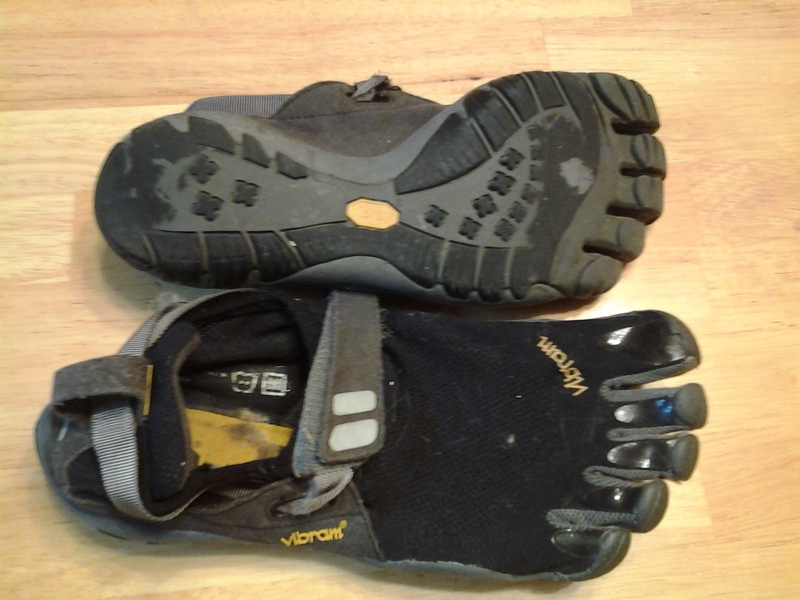 These I wear almost every day to further enjoy the dynamics that the Vibrams provide. So with the increase of running has come a significant amount of health benefits and just overall feeling better about myself. There are two major differences that I found most interesting. The first is that the structure of my foot changed (for the better). Besides becoming more muscular, they developed more of an arch and my toes have more movement (and a good grip). The other effect is that overall, my feet feel more planted in the ground when I step and I have a much stronger sense of balance. All of which makes sense given that my feet are being used more directly than being muted out by regular shoes. 1 year later and my choices seemed to have been solid ones indeed. I'm 15 pounds lighter. I'm running (and even training for a half marathon) and overall, I just feel good. Last Wednesday (June 20), I had an amusing insight that I shared on Twitter: "last year around this time, I began walking to work...today, I ran...#awesome #running." So if you're looking for a change of some sort, I would recommend either or both of these--though not without some consideration of if they would fit your current life/work/personal demands.